Heat gas or charcoal grill. In medium bowl, mix pork, seasoning and 2 tablespoons reserved pineapple juice. Shape mixture into 4 patties, about 1/2 inch thick. Place patties on grill over medium heat. Cover grill; cook 6 to 7 minutes, turning once, until no longer pink in center and meat thermometer inserted in center of patties reads 160°F. During last 4 minutes of cooking time, add pineapple slices to grill, turning once. 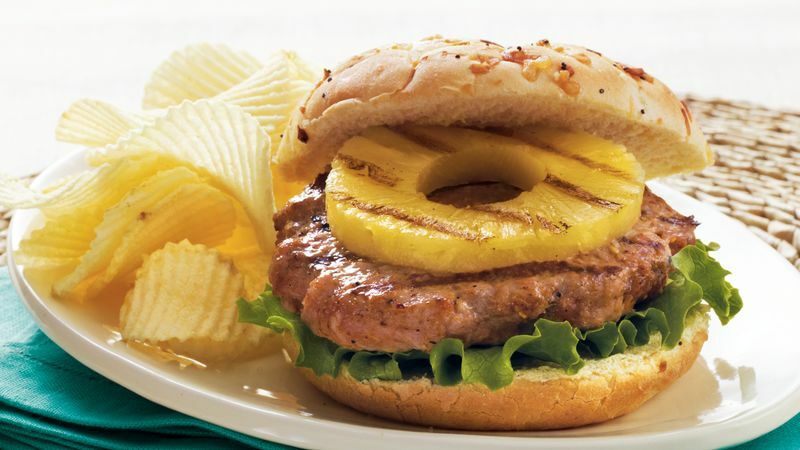 On bun bottoms, place lettuce, burger and pineapple slice. Cover with bun tops. Substitute other rub flavors for the applewood. Grill a few extra pineapple slices, and save in refrigerator to add to chicken salad another time.